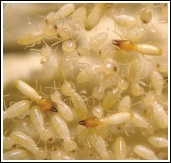 Termite companies, even the most reputable ones, frequently dispense archaic information about the products in their profession. Many pesticide control operators incorrectly believe that all the dangerous pesticides have been pulled off of the market. No one wants their house damaged, but no one wants their health damaged either. Chemical pesticides stick around for a long time (long "residual"). Vacating the premises during a pesticide application doesn't mean you are safe from pesticide-related health consequences. Buy this SaferBuilding™ How-To Sheet to learn alternatives to controlling termites, understand the safety issues involved, and how to talk to your contractor about them.